Whips up a feast in the kitchen, grows her veggies in her garden patch, dabbles in photography. Self employed as an interior decorator, loves to gift pretty things she crafts herself. When a Mom of a little kid does all this and more, its hard not to be impressed! Sayantani Mahapatra of A Homemakers Diary calls herself a true Bengali at heart, though Bangalore was home to her for quite sometime. It was a surprise for me to discover that she lived in the same city, though I have not had the pleasure of meeting her when she was here. Try resisting this Tangerine Ricotta Pudding or these Baked Savory Onion Crackers. Eye-catching Shahi Gulabs will make a fantastic center -piece for your next dinner party. Ditto to her Naksha Bori. If you live in Kolkatta you will love her for compiling info on sourcing baking ingredients in the city. Hop on to her blog for all this and loads more! Thank you very much for your kind words for me Sayantani, I am truly humbled. 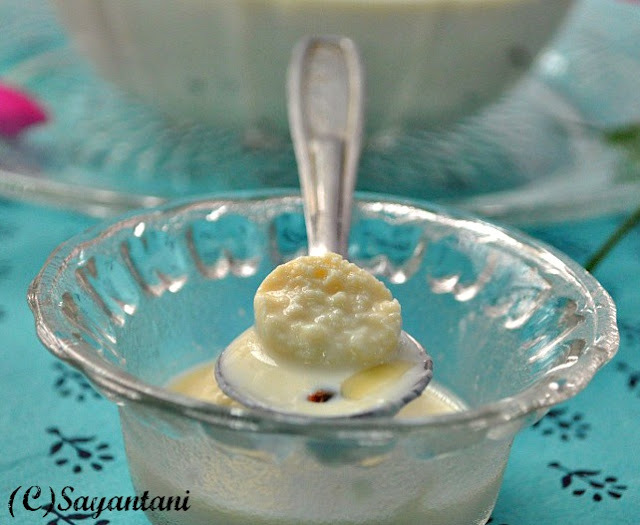 Love your Angoori Rasmalai, which happens to be one of my favorite favorite Bengali sweets. So here is Sayantani bringing for you spongy cottage cheese dumplings soaked in saffron laced milk - Heavenly, absolutely!! Suma, this lovely lady is not only the face behind my most favorite Indian baking blog Cakes and more but also is a source of inspirations to me. I have written many times how she helped me to realize my long-standing dream of baking bread at home. Every time I look at her blog I am amazed at how she manages so many things at one time. When I struggle with a 3 years old she efficiently manages her job, two kids, home and then she bakes beautiful treats. Fudgy brownies, crunchy cookies, pillowy breads and creamy puddings…you will find every baked goodies in her blog which dreams are made of. Every time I check her blog I feel like shifting base again and rent a place near to her house. So when she asked me to do a guest post for her I was more than delighted. Not only this is my first guest post but the fact that the opportunity is for one of my favorite blogs made it extra special. Very logically my first choice was to submit some baked goodies but the oven has just got busted a few weeks back so here I am with a recipe that my family thinks I make best, a recipe for a cherished Bengali sweet. In my home this is known as guti’r payes or milk pudding with tiny little balls of rasgullas but when I came to kolkata I found this being sold as Rasmalai. I fought with the shop keepers in favour of those plump oval shaped spongy dumplings soaked in heavenly saffron flavoured milk, known all over India as Rasmalai. 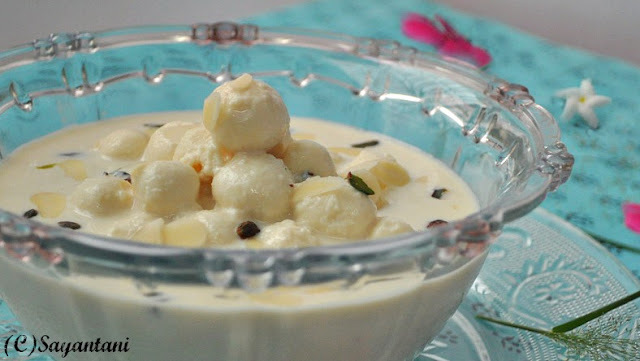 But no they dint budge and kept on saying that this is Bengali Rasmalai. Even many of my Facebook readers confirmed this as Bengali Rasmalai and some even informed another name of this dessert as ‘Indrani’. Though am not yet sure of its name but that does not reduce how amazing it tastes. 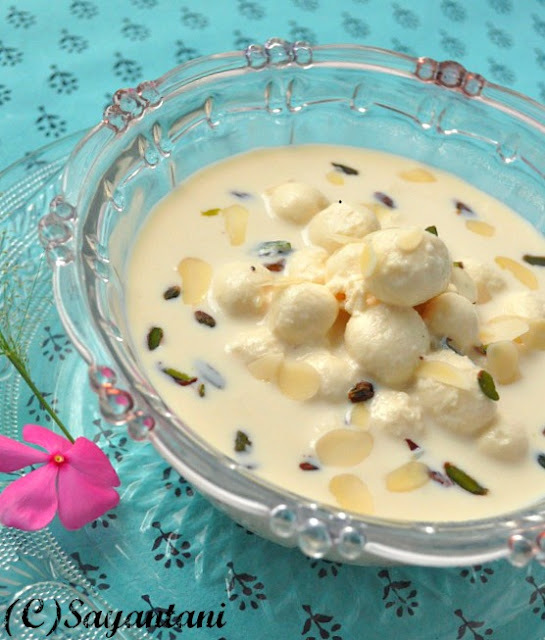 Given a chance I much prefer it to the regular rasmalai. The tiny little spongy cheese balls are a delight to bite on. almost like burst of sweetness and juices on your tongue. Also if you are a confident pressure cooker user making this does not take much time. Lets make the chana or cottage cheese first. Heat 1-liter milk in a thick bottomed pan. Once it starts to boil pour in the limejuice. Reduce the flame to low and stir gently. The milk will curdle and clear whey will separate. Strain the paneer in a muslin cloth. Wash under cold running water to get rid of the lemony smell and then hang it for ½ an hour to drain the extra whey. After that tie the cloth to make a small pouch containing the cottage cheese. Place this on an inverted stainless steel plate. Cover this with another rplate and Place something heavy on it like a stone mortar or a 5 liter jar of oil. Keep it like this for another 30 minutes or so. At the end of it take out the cheese on a wide plate and start kneading. Gently press and spread it on the plate with the heel of your palm. Do this for 4-5 minutes or till a smooth dough is formed. Make very small (pea sized) balls out of it. Roll between your palm to make the outer surface smooth. Boil the 3 cups of water and the sugar in a wide pressure cooker. Add 2 crushed green cardamoms in it. Once the syrup comes to a rolling boil place the chena balls in very carefully. Attach the lid and cook on medium till two whistles. Let the steam dissipate naturally. Open and carefully take them out one by one. Try not to crowd the cooker or the tiny balls will break. Do this in 2-3 batches. gently for another couple of minutes. Cool and sere with a generous sprinkle of flaked almonds and chopped pistachios. 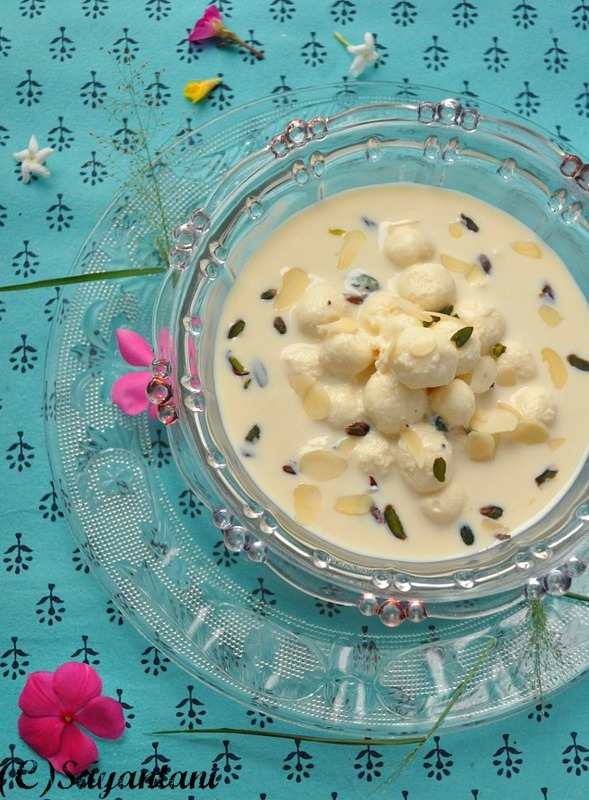 Hope you will like this dessert recipe while Suma is away on a small blogging break. Food doesn't just taste exactly the same, though the recipe may be exactly the same. Think something you tried using your Mom's or a friend's recipe. So what makes food taste good, but not the same as cooked by the other person? Archana calls this the The Yum Factor! I completely am with you on this Arch! This true blue Bangalorean in Ahmedabad realized just how badly she missed her own kitchen when she had to live in a guest-house for a few months. Got a kitchen of her own again and then The Yum Factor was born! The new bride who wormed her way into her hubby's grandmother's heart with a simple rasam, the techie who gave up her career to play full time Mom. I had the pleasure of meeting her recently. We chatted away nineteen to the dozen, predictably food mostly, kids and life! 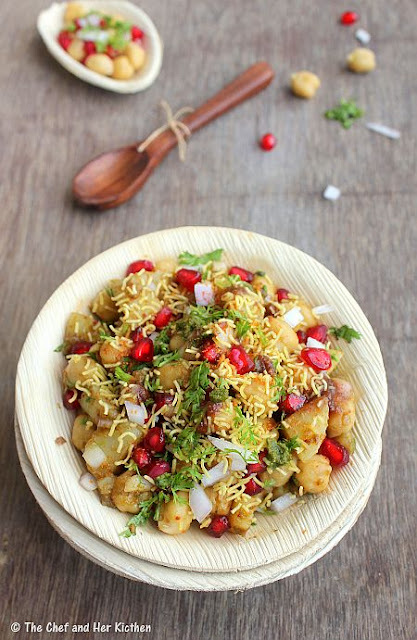 Check out her blog for loads of Mangalorean / Konkani recipes, baking, heaps of vegetarian side dishes you could try each day on the month! How I would love these corn and corn and cottage cheese flecked savory muffins for my evening snack! This Christmas Cake must be among the goodies I bake this Christmas. A chocolaty way to eat bananas? This Chocolate Banana Cake is just the thing! Am humbled by your words for me Archana! Thanks so much for taking time for putting together this lovely post and an even more delicious tea-time treat for me! The whole house had a lovely aroma once I got this in the oven. And I was all set to take the pictures - and by the time the cake was done, for my luck, it started pouring outside. It was about 5 in the evening and threatening to get all dark and gloomy outside. The pictures didn't turn out so great, but this was the perfect for the weather. 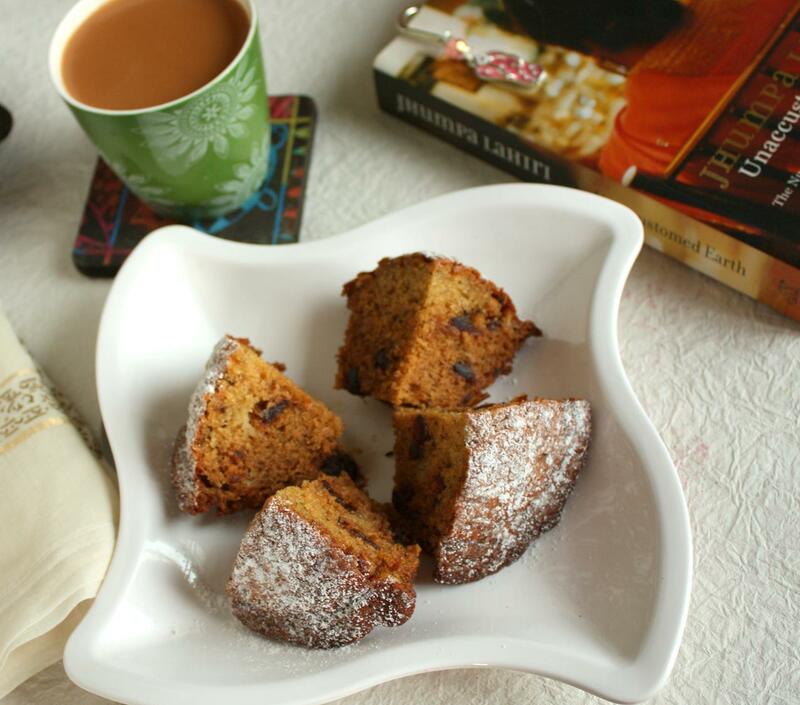 Warm cake straight out of the oven for an evening tea, with thunder playing in the background. 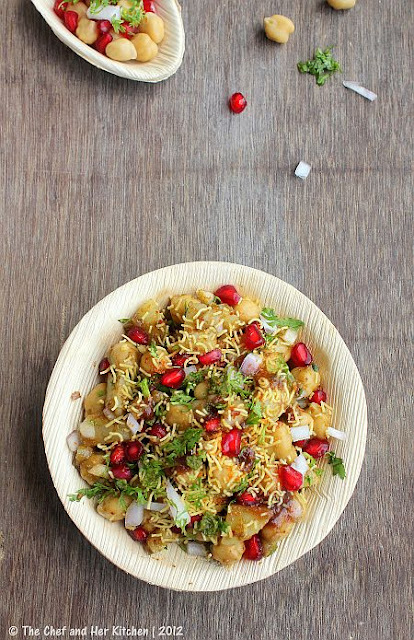 Experiments, emotions and experiences with food - Sweatha Pai has it all for you! Her yummilicious blog - Tasty Curry Leaf. An extremely avid baker with a vast repertoire of mouth-watering egg-less and vegan bakes, desserts, yeasted bakes and a whole lot of Middle eastern cuisine, her space tempts you to try them all! Did I just stress Middle Eastern? Wait! There is Turkish, Vietnamese, Korean, Mexican, Italian, English and American to name a few cuisines she dabbles in. Well! That leaves very little of global cuisine she hasn't tried yet! Mind you, all of these are egg-less and some even vegan! I bet her family just doesn't know what boring and mundane means when it comes to food! You bet I also don't want her to know what I cook for my family everyday - yaawn!! So the next time you feel adventurous and want to try something new, you know where to head to!! I have drooled over her Herbed Sour Cream Biscuits, Oatmeal Crisps, and Caramelized Onion , Rosemary And Tomato Flatizza .. these have to be tried! Ooops! Sweatha is supposed to do the talking here! Here she is tempting you with a delicious cinnamon laced Apple Galette, made all the more tempting as its easier too! Thanks Sweatha for your very generous and kind words for me, not sure if I deserve all that, but you sure made my day! What do you cook for a baking and dessert queen? When you see that she is an expert baker and dessert specialist and has conquered some of the excellent cakes and bakes in her blog, what would you cook/bake for her when she has invited you for a guest post? Actually I was ready when Suma invited me for a guest post. The first idea was obviously a cake. A simple eggless chocolate cake for Cakes n More. Then as usual I had the doubt.A simple chocolate cake for a person who has conquered exotic breads and bakes!. Of course it will be good, but is it enough? Matt Preston boomed in my head, "Is this dish enough to take you to next level?" "Is this dish worthy of Cakes n More standards?" Racking my brains I decided a galette is my safest bet. Its rustic,can be made slightly roughly without the decorative rules that come with a pie and its perfect for the dessert queen and also perfect for me on a chilly night.And as usual my amateurish clicking skills can be forgiven as well. A galette is a general term in French cuisine covering most thick round flat breads or free form crusty cakes.It is definitely similar to Italian crostata and can be called haphazard pies.These days of course the term refers to rustic pies with a rich and flaky crust stuffed with fruit or veggies,the common and popular one being apple galette. Basically, you are making a rustic or free style pie using buttery pie crust.I have also baked an apple galette for dear Suma with little variations here and there. You do not need to know rocket science to make a galette, except of course little of pie science. For the crust, mix together flour and salt and cut in cubed butter with a fork and mix in till it resembles coarse breadcrumbs. Add in 1 tbsp water at a time and mix in till the flour is moistened. Here the key thing is you should not overwork the pastry. Try mixing the butter gently with a fork or just your finger tips and add just are minimum of water as needed to moisten the flour. There should be water to support butter as a binder but just enough.Also make sure the butter and water are ice cold. This is needed to prevent the development of gluten in the flour. Gluten will make the crust tough. Overworking the dough or warm ingredients will produce a tougher or crusty crust. We want a soft, slightly crumbly,flaky and buttery pie crust. Once the dough is formed wrap it in plastic and refrigerate it. It can stay in the refrigerator for maximum 3 days. In case you are not baking the tart/galette/pie immediately, it can be frozen for upto 2 months. While the dough is resting, prepare the filling. Slice the peeled and cored apples, toss it with lemon juice to prevent darkening and then mix it in with 1 tbsp of brown sugar, powdered spices and almond meal or flour or powdered. Almond meal is completely optional. I just added it to absorb extra juices if any overflow during baking. You can use flour,cornstarch arrowroot powder etc instead or completely leave it out. Let it sit for sometime while the flavours are mingling.Always do the taste test and adjust the sugar and spices to get what you like. Take out the dough, divide it into two balls, refrigerate one while working on the other. On a lightly floured surface or plastic sheets, roll out the dough gently into a circle of about 1/4 inch thickness. Once this is done, transfer it to the lined baking sheet and start layering on the apple slices in whatever way you like leaving an inch or half around the edges free.You can go for nice designs while layering like arranging in overlapping concentric circles or whatever way you prefer. Once done, fold the edges inward on top the fruit. Sprinkle little brown sugar on top and dot it with additional butter if you like. Once this is done you can brush the folded edges with milk/melted butter and sprinkle some more brown sugar on top. Repeat the steps with the second dough ball as well or freeze it for later use. One galette serves 2 or just 1 if you are a dessert person!You can even go for smaller galettes which is what I did with my other dough ball and got two bite sized galettes. Bake in a preheated oven at 375 F or 180C for about 30-35 minutes or more until the pastry is golden brown, the fruit bubbles and a warm aroma of comforting baking spreads all over. The mini ones took barely 25 minutes to finish. So just keep an eye on from the 24th minute onwards. Take out cool completely or till you can control yourself. Then attack. Oops I forgot to tell you about the sauce. Its a simple custard sauce using ready made custard powder. Something quickly put together when you are in a hurry to consume the galette. I just followed the instructions that came with the packet and within minutes it was ready. But of course the barring one, the galettes were over within minutes my daughter set her eyes on them. She did not even need the sauce. Galettes can also be served along with the usual accompaniments of ice cream,whipped cream or even dessert sauces or simply glaze with jam and serve. "Will this dish take me to a higher level? " Matt booms. "Yes of course, I definitely believe so Matt if you excuse the use of custard powder. Now its upto you Suma." Deepthi Shankar aka Deesha. You know the pretty, petite, ever-smiling blogger behind Vegetable Platter. We bumped into each other courtesy blogger-ville. And then discovered we have both lived in the same town, although never met each other earlier having studied in different schools. Small world! 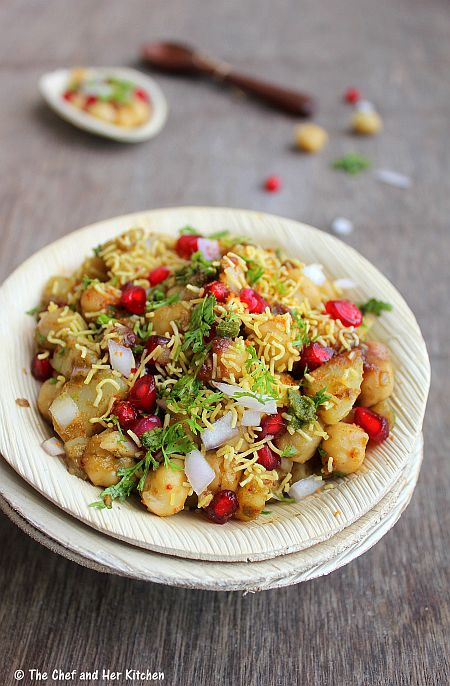 Deepthi's 4- year-old blog is full of amazing pictures and recipes of drool worthy food, primarily South Indian cuisine. Savory Onion Crackers / Baked Nippattus made all the more wholesome with whole wheat and oats, wicked Mango Burfi and a very interesting Tomato Bhartha have been on my to-try list from her space. Love her photography, the knick knacks she uses to make the food truly stand out. Thanks Deepthi for taking time out for this post! You are too generous with your kind words for me! 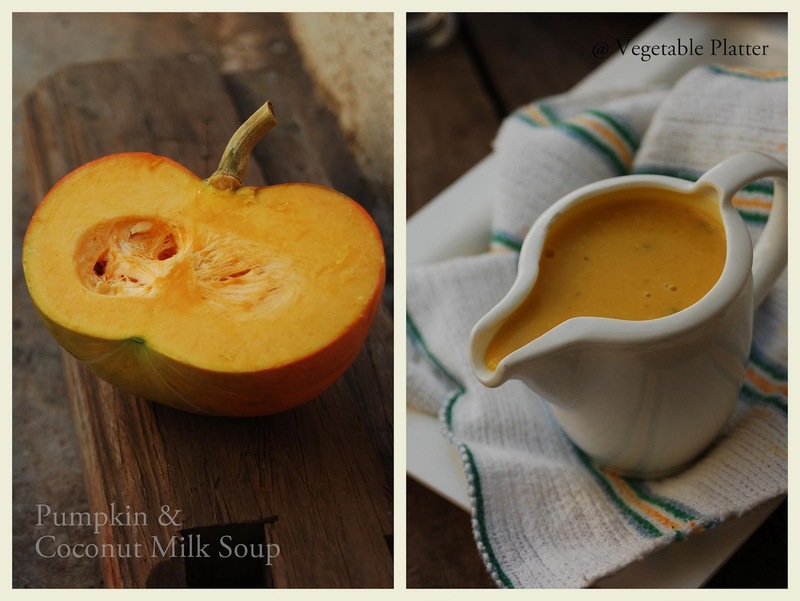 Here is a lip-smacking Pumpkin Soup laced with the flavors of galangal and coconut from Deepthi..
break, I hope you will enjoy this recipe. Thanks Suma for the opportunity. Now let’s head to the recipe, Shall we? Bring a pot of salted water to boil, add pumpkin cubes & cook till they are nice & soft. Reserve the water & set aside. onions & sauté until the onions turn slightly pink. Set aside & allow it to cool a bit. very little or no water. coconut milk, soy sauce & brown sugar, check for salt & gently simmer for about 10 mins. Serve HOT with crusty bread & enjoy your meal! I used store-bought coconut milk but can make it on your own too.You can also use canned pumpkin puree & a tbsp of ready-made Thai curry paste instead of the spices, I’ve used here. Makes it even more easy & quick. Few things make the day of a food blogger like meaningful comments do. 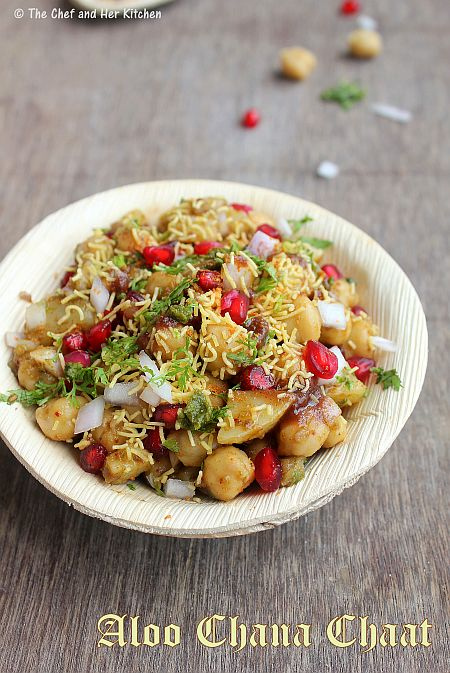 One such meaningful comment lead me to Sumana's blog, Sum's Cuisine. A fellow Bangalorean and a Kannadiga, it was so easy to connect! Food bonds undoubtedly, but when we cook, eat and blog about similar kind of grub, its even better! I have not met Sumana yet, but very much look forward to meeting her some day and also eat a meal at her place, only now its Sweden!! 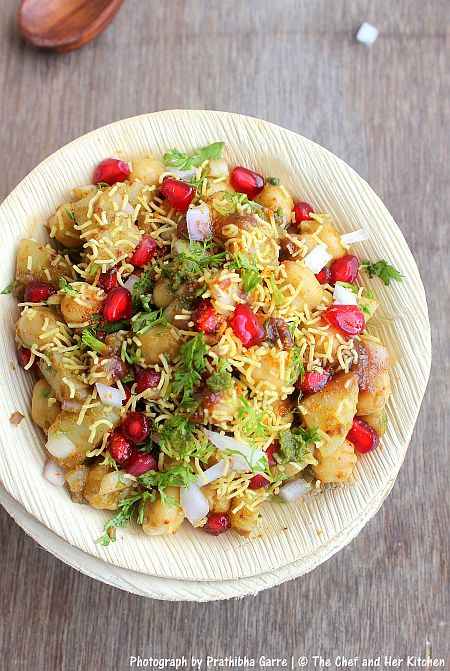 Her blog Sum's Cusine has lots of Authentic Karnataka Cuisine , eggless bakes and lots more! Her Eggless Zebra Cake , Spicy Biscotti, Avarekalu Kadubu, Gorikayi Matodi Palya among so many others make me wish I had visited her when she was still here, sigh!! Here comes Sumana with an amazing Herbed pull apart bread - spicy mint and cilantro chutney encased in a soft yeast bread , baked in a bundt pan...I can almost smell the aroma! When Suma asked me to do a guest post for her lovely, delicious blog, I was more than delighted! She has such a beautiful blog with so many amazing delicacies. And I just love her witty writing. I make sure I don’t miss her post for two things - a nice write up and a nicer delicacy! Every time I want to bake something, I’d definitely look up in her blog for something. So when she asked me to guest post for her blog, my first thought was a cake, but for someone who has baked almost half a century of varieties of cakes and cup cakes, finding another cake to match was a difficult task! So here I am with a yeast bread, another of her passion. 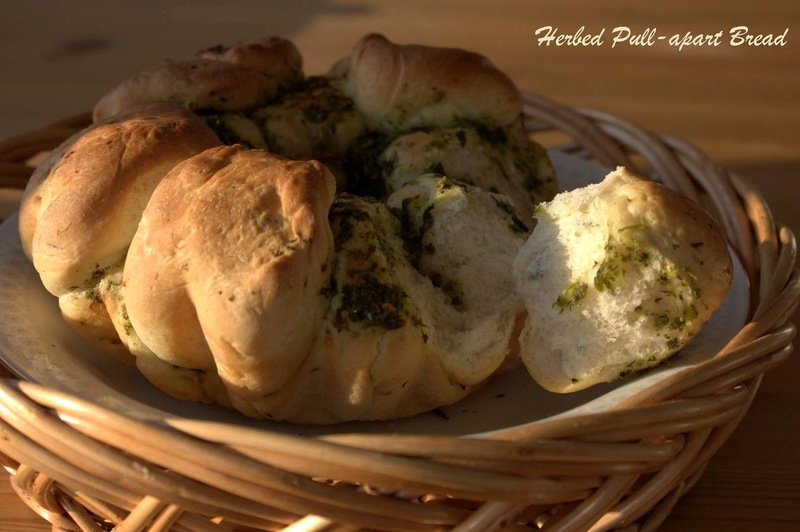 This is herbed, garlicky pull apart bread, with herbs like mint and coriander. 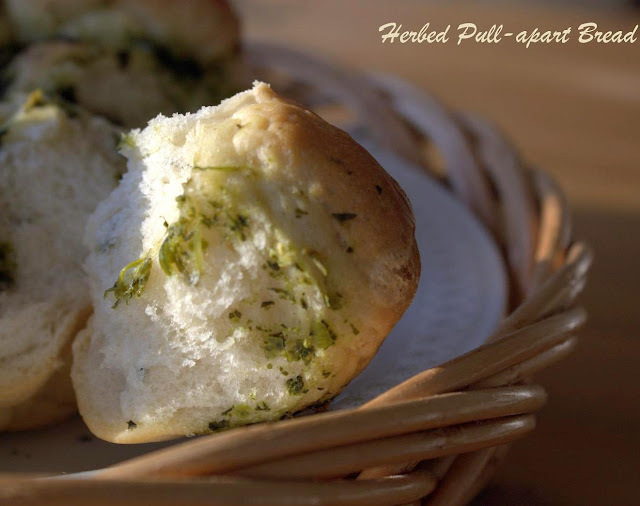 It can be made with Italian herbs too, dried or fresh. 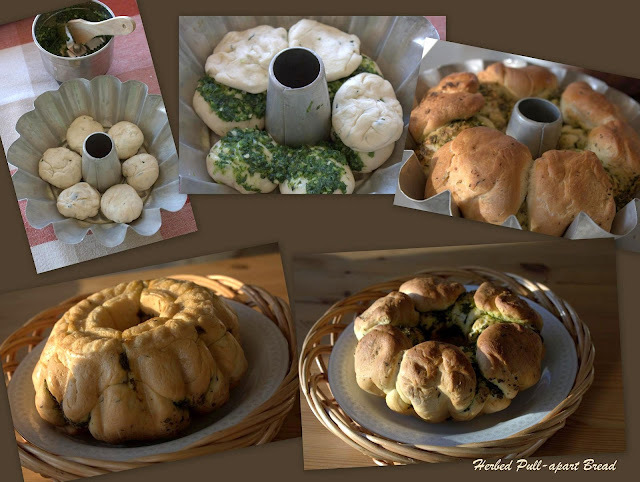 The recipe is adapted from Champa’s pull apart loaf here, but halved and baked in a bundt pan. Love the shape a bundt pan gives to a bread! It is a very tasty bread. • In a bowl, take warm water, sugar. Add yeast to it. Let it stand till it froths. If using instant yeast, can proceed to next step without proofing. • Add the remaining ingredients to it and start making a dough. When all the flour has been absorbed, knead it for 10 minutes or until it is smooth and elastic. It should not be sticky or tacky. If it is, add 1 TBSP flour at a time and knead it. • Place in an oiled bowl and turn it once to coat all the sides. • Cover and let rise in a warm place. About 45 minutes to an hour or till double in bulk. • Meanwhile, grease a bundt pan with oil on all sides. Set aside. • In a food chopper or blender (small jar) or mortar and pestle, take all the ingredients mentioned in 'For paste' and mince them so that it is a coarse paste with some oil. Don’t add any water. Adjust the salt if necessary and set aside. • When the dough has doubled, punch it down. On a lightly floured or greased surface, divide the dough into 12 small portions. • Take one dough ball and flatten it to about ½" thick. A rough oval shape will be fine. Repeat with the remaining dough balls. • Place one dough ball in the pan, top it with little bit of the paste and spread it. Make sure you use the paste evenly to coat all the dough balls. 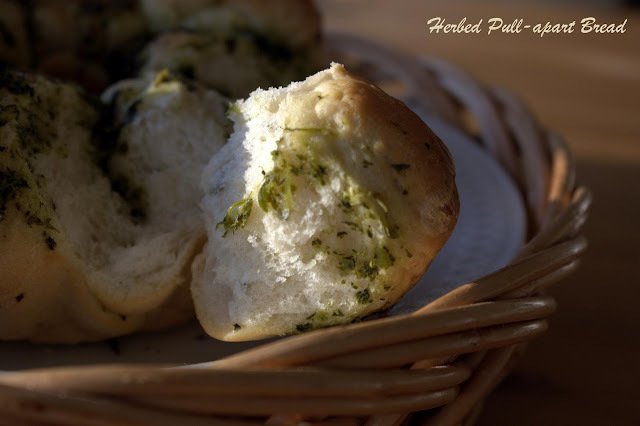 • Arrange the dough balls in the pan in two layers, with paste coated between them. • If you have any more paste remaining, you can spread it on the top. • Even if the dough is not full in the pan, it will get full after the final rise. • Cover loosely with oiled plastic wrap and let it rise till the dough is double. About 45 minutes to an hour. • Towards the end of the rise time, preheat the oven to 375 F or 190 C.
• Bake for 15 minutes. Rotate the pan and reduce the temperature to 350 F or 180 C. Bake for 5 - 8 more minutes or until the top is golden brown. • Cool in the pan for 5 minutes and then invert it on the wire rack to cool completely. • Pull the bread when completely cool if you can resist the smell that long. I pulled it when it was still warm, just like Champa did :). • Keep the pan vertically and stack the pieces one on top of another till finished. Keep it back horizontally and adjust the stack and bake for 25 min at 190 C and 5-8 min at 180 C.
Thanks so much Sumana for this lip-smacking good bread! Its really sweet of you to send this treat my way!